Turkey's military said Friday its jets had bombed nearly 60 Kurdish rebel targets in an attack this week in northern Iraq. Turkish jets targeted rebel positions on Tuesday in the fourth cross-border aerial attack since Dec. 16. The military said earlier Friday that 10 Kurdish rebels surrendered after the air strike. The warplanes destroyed five command centers, two communication centers, 15 training centers, 12 logistics facilities, 18 shelters, two anti-aircraft batteries and four ammunition depots, the military statement said. The rebel targets were in the Zap-Sivi, Avasin-Basyan and Hakurk regions, it said. The military also distributed video footage and images of the operation, in which laser guided bombs were seen hitting some targets. A large quantity of weapons, ammunition and other equipment was destroyed, it said. The military said a study was under way to determine the rebel losses through various methods, including intelligence reports. There has been no immediate rebel reaction to the military's statement. The Web site of the pro-Kurdish Firat news agency, which often carries rebel statements, was blocked on Friday. A one-line sentence in Turkish and English that appears on the screen reads: "Access to this page has been blocked by law court decision." Ten Kurdish rebels, who reportedly fled rebel camps in northern Iraq, turned themselves in to authorities on Thursday in the Turkish town of Silopi near the Iraqi border, the military said Friday. A total of 21 rebels have surrendered over the past month, it said. The rebel Kurdistan Workers' Party, or PKK, has battled for autonomy in southeastern Turkey for more than two decades - a campaign that has resulted in tens of thousands of deaths. 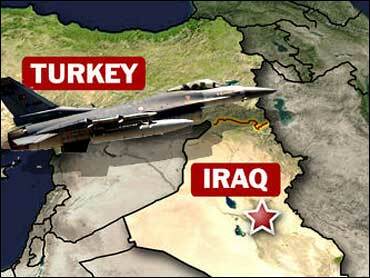 It uses strongholds in northern Iraq for cross-border strikes into Turkey. In October, the Turkish parliament authorized the military to strike at the rebels across the border. The United States - which with Turkey and the European Union considers the PKK a terrorist organization - has cautioned Ankara against a large incursion, fearing it could disrupt one of Iraq's more stable regions. In an apparent retaliation for Turkish attacks, suspected Kurdish militants blew up a car bomb in the southeastern city of Diyarbakir Jan. 3. The death toll in the bombing rose to seven on Friday when a high school student died of severe burns at a military hospital in Ankara. Although there were dozens of army officers among the 66 injured, all of the dead were civilians and mostly students. Iraqi troops fought gunmen from a Shiite cult Friday in southern Iraq, leaving at least 13 people dead and 18 wounded, police said. The battles in Basra and Nasiriyah began after members of the Soldiers of Heaven group, called the Jund al-Samaa in Arabic, attacked police and worshippers preparing for Ashoura, the holiest day on the Shiite calendar. The violence began after noon with a mortar attack targeting police in Nasiriyah, a predominantly Shiite city some 200 miles southeast of Baghdad, followed by fierce clashes between gunmen and police. Police said the attackers were carrying yellow flags indicating they belonged to the Soldiers of Heaven. The cult is considered heretical by mainstream Shiite clerics. Ten people were killed in the fighting. Fourteen were wounded. Street battles also broke out in Basra, another Shiite city 340 miles southeast of Baghdad. Police said two officers died and four others were wounded in the fighting, which started after armed men attacked police and Shiites observing the commemoration of the seventh century death of Imam Hussein, one of their holiest saints. A mosque belonging to the cult also was burned by police after they were fired upon by people hiding inside, authorities said. Basra police chief, Maj. Gen. Abdul-Jalil Khalaf, said later that the leader of the group in Basra, whom he identified as Abu Mustafa al-Ansari, also had been killed. The Pentagon's top generals and admirals will make their own assessment for President Bush on whether to continue pulling U.S. troops out of Iraq in the second half of the year - independent of what Mr. Bush's commander in Baghdad recommends, the top U.S. military officer said Friday. Navy Adm. Mike Mullen, chairman of the Joint Chiefs of Staff, told reporters traveling with him on the last stop of a six-day trip that the Joint Chiefs will take into account a range of issues beyond the security situation in Iraq. They will consider, for example, the effects of growing strain on troops and their families from multiple tours in Iraq, as well as the outlook for troop requirements in Afghanistan and elsewhere, Mullen said. Defense Secretary Robert Gates announced at the Pentagon on Thursday that he had asked the Joint Chiefs for their Iraq assessment, to coincide with recommendations from Gen. David Petraeus, the top commander in Iraq, as well as Adm. William J. Fallon, the commander of American forces in the Middle East. The Joint Chiefs intend to have their consensus view ready for Gates and the president by March or April, Mullen said. Mr. Bush needs to hear the views from a range of senior military officers, Mullen said, on "the risks that are associated with whatever we're going to do next" in Iraq, where about 160,000 U.S. troops are on the ground in a conflict that appears, for the moment, to be leaning in favor of the U.S. and Iraq governments. A Virginia soldier has died in Iraq. Killed on Wednesday was 27-year-old Private First Class David Sharrett II, of Oakton, Va. Authorities say he and two other soldiers who died were attacked by grenade and small arms fire during combat operations. As of Thursday, Jan. 17, 2008, at least 3,926 members of the U.S. military have died since the beginning of the Iraq war in March 2003, according to an Associated Press count.